We’ve discussed the integration further with Karl elsewhere. 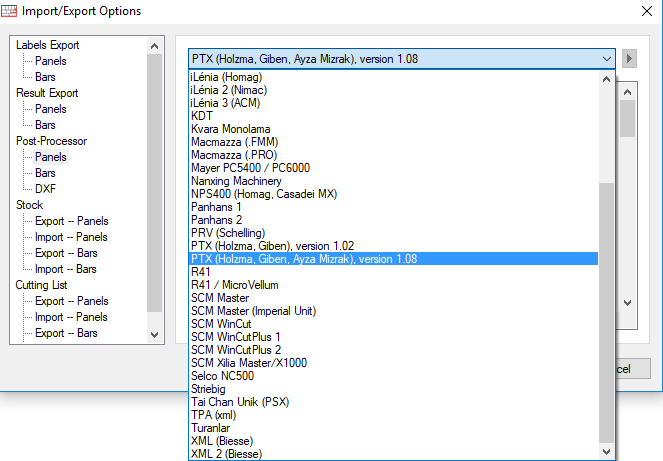 One further note here however on the 2 PTX post processor options. For clarification PTX 1.08 is for recent saw models while PTX 1.02 is for older ones. We are happy to provide sample OptiCut output in both formats for testing with a Holzma CNC saw or indeed provide other post processor outputs for any other saw on request. However, it doesn’t include all the post processor files as there are so many. We can send those though. Are you using a CNC saw? If so, can you tell me which model. I would like to receive your test file because i cannot get it to convert. We recently had an enquiry from a workshop who were using the Holzma HKL380 saw. This saw model belongs to the Holzma saw range. OptiCut Pro PP has a single Post Processor that covers the whole Holzma range via the PTX file format. All transfers to Holzma saws should go through the PTX file format. The Holzma saws are generally equipped with a HolzLink controller interface, which converts external PTX files into SAW files. The SAW file format is the internal Holzma file format, but for technical reasons should not be generated by external software directly. As well as HolzLink, Homag offers the CadLink interface on some of its saws, which will also accept PTX files from OptiCut. Please first check if your saw is equipped with one of the 2 above controller interfaces. If the answer is yes, we can provide test output in the PTX file format to confirm the integration with your saw.